Tiziano Terzani, born in Florence, Italy, was for 30 years Asia correspondent of the German magazine Der Spiegel. As such he was based in Vietnam, Hong Kong, China, Japan, and Thailand. From 1994 to 2004, the year he passed away, he was sharing his time between India and Italy. He has written several books, including The Forbidden Door; Good Night, Mister Lenin; Letters against the War, and A Fortune-Teller Told Me. It’s Henri Cartier-Bresson, impressed by Raghu Rai’s work after an exhibition in Paris in 1971, who invited him to join Magnum in 1977. In the first part of his career, he reports on India on its social, political and cultural dimensions. Later, he decides to cover India in an exhaustive way as much as possible. Since 1984, he reports for Amnesty International on the catastrophe of Bhopal’s chemical factory and its consequences for survivors, a 20-year work that is published all around the world. He already publishes 18 books, and received many international Prizes. He’s been exhibiting his work in London, Paris, New York, Hamburg, Prague, Tokyo, Zurich, Sydney. His photos were published in Time, Life, GEO, the New York Times, Newsweek, the New Yorker. He’s based in Dehli. The greatest Indian photographer, a member of Magnum since 1977, shares his vision of India, through all its excesses, on the rythm of the odes written by Tiziano Terzani, one of the rare Westerners who got that close to the intimate reality of the subcontinent. 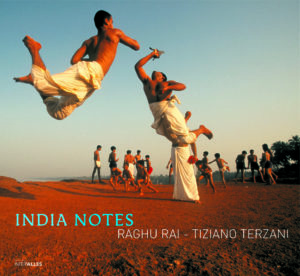 India notes is a dialogue between two wonderful visions of India. The one of a Westerner in love with the country (with all the complexity that such a feeling can carry) and the one of a local who spent his life reporting on such a huge territory and its recent changes. From these two « commitments », a troubling alliance arises, sometimes funny, sometimes choking, or just amazingly seductive. Raghu Rai’s pictures show India in all its dimensions, a country of sharp contrasts and fast changes, on which some immemorial culture and a certain sense of spirituality seem to glide. The texts written by Tiziano Terzani (extracts from his best-selling book, Un altro giro di giostra) are like a passionate ode to this enigmatic territory.